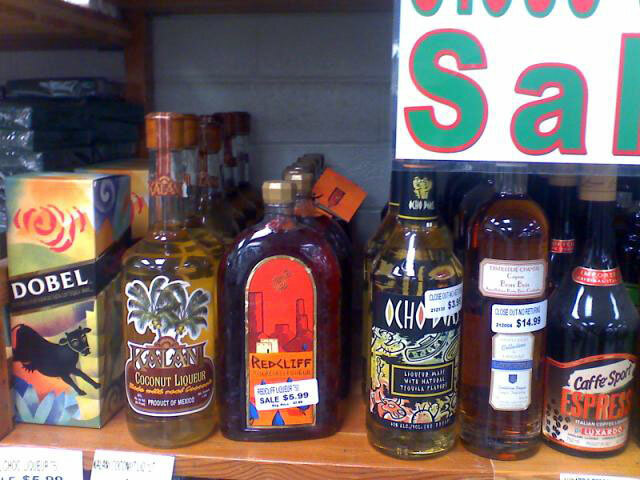 Here’s what was on the “closeout discount” table at the local fancy liquor store. This place sells every tipple you can find anywhere. Here’s what they can’t sell at all. The other shelves mostly contained emetic fruit mixers and unknown vanity vodkas. Try this “Redcliff.” It’s America’s Liqueur. For connoisseurs of pounding hangovers! You were in a dream I had last night. All I remember is you walking with a clique of coolies, beckoning me to join you. It was pretty rad. CLIQUE OF COOLIES is awesome enough! wow, all label designers fired, effective immediately. One two three four, I declare a cocktail war! What drinkable cocktail can you make out of these misfit liquors? I can’t read the labels well, but it seems you could make a “Brave Bull” (Tequila and coffee liqueur, twist of lemon), a spicy Lemondrop (using the Redcliff as spiced rum) and perhaps something with the coconut liqueur (what, “rum” is too middlebrow for ya?) and the Caffee Sport thingy that might not be bad. Philistine. None of these should be mixed. Perhaps a little water or one ice cube. The Redcliff can be mixed with soda if someone girly demands it.